Lucius Cabins writes on the 22 day nationwide strike of 700,000 telecoms workers at AT&T in 1983. The 22 day nationwide strike by 700,000 telephone workers provided a window on the relative strength of capital and labor in the current era. In classic style, both management and unions are claiming victory, since neither side was able to push through its most aggressive bargaining goals. The union successfully resisted the "takebacks'' that management demanded. Nationally, AT&T sought a restructuring of medical insurance payments that would transfer up to 25% of basic costs to workers, but surrendered in the face of union intransigence. In California, Pacific Telephone workers won two important issues when they resisted the imposition of split shifts in all depatments, and maintained the 7 1/2 hour work day for clericals in spite of PacTel demands for an 8 hour day. On the other hand, AT&T and the soon-to-be-divested regional basic operating companies (BOC's) overcame union demands for guaranteed job security, establishing instead a miniscule $31 million "retraining fund'' for workers whose jobs become obsolete and an incentive-bonus program for early retirement. No specific job protection guarantees were made, the company thereby reserving its "right'' to lay off and transfer workers according to market conditions. Given the forthcoming deregulation of the communications industry, phone service employment will significantly diminish over the course of the three year agreement. The severance payment plans do represent a concession by management to cushion workers from layoffs, but for a corporate giant with $7.2 billion in profits last year, and $1.9 billion in the first quarter of this year, it is a small price to pay in exchange for control over workforce levels and the labor itself. Both sides have expressed satisfaction with the wage settlement, 5.5% in the first year, 1.5% + COLA in second and third years (estimated total for the three year contract is 16.4%). For the company the settlement looks good because it is less than each of the last two national contracts; it is substantially less than the 28.5% granted to GTE telecommunication workers in bargaining last year; and most importantly, the BOC's are blessed with very low built-in labor cost increases for the first two years of their marketplace independence ('84 & '85). The unions, for their part, can point to the total increase of 16.4% as an improvement over widespread wage freezes and wage cuts agreed to by other big unions. The media has made much of the 97% automation of basic phone service that made it possible for 700,000 people to strike without much affect on the public. Of course, this high level of automation did hurt workers' power to affect phone service from outside the workplace. The company could also rely on a built-in force of 250,000 strikebreakers--its vast bureaucracy of "managers,'' most of whom usually perform routine information processing and have only narrowly-defined decision-making functions. The Bell System assumes it has a basically uncooperative and "lazy'' workforce. Thus, it exercises rigid control over all its operatives via close surveillance and evaluation of workers and managers alike, and more recently through computerized tracking of work performance. Now that the machines are able to take on much of this work, Bell is saddled with a redundant, costly middle-management bureaucracy. During the strike, most middle managers were in a sense re-proletarianized, as they went back to being operators, linemen, sales clerks, and secretaries, commonly working 12-hour days and 6-day weeks. In the Bay Area there were grumblings about starting a "managers' union'' for future protection from these conditions. This strike experience could be a hint ot what's to come for managers with further industry automation and rationalization. There was significant discord among the management bargainers during this strike. Marketplace competition is only a few months away, and different prospects for profits are facing different BOC's and AT&T itself. PacTel in California and several units in the new Bell Atlantic region (around Philadelphia, Baltimore and Washington D.C.), fearing that deregulation and divestiture would aggravate their already weak financial conditions, pushed for substantial takebacks in this contract--this hard-line position prevailed in the early stages of the strike. Eventually, however, AT&T and other regional bargainers, wanting to ensure relative peace and stability during the break-up process, reached a compromise contract agreement. The greatest weakness of the Bell System in this strike, ironically, proved to be the divestiture process itself. Because so much managerial and marketing time is being spent gearing up for "1-1-84,'' the actual date of the breakup, there is a great deal of clerical work to be done--work which, while invisible to the public, is nonetheless crucial to the current and future profitability of the phone companies. The hundreds of thousands of striking word processors, data processors, key punchers, typists, secretaries, file clerks, etc. crippled the phone company's ability to continue vial information processing. AT&T needs to get the divestiture over with as soon as possible. They are getting out of basic phone service just in time for the fast-moving technological upheaval in the communications industry. The phone system needs to upgrade its technology and overhaul its operations if it is to maintain a slowly falling share of the total communications market. By divesting itself now, AT&T is taking half its total assets, plus its most innovative and competitive divisions, into the competitive and profitable communications marketplace. The strike caught the unions unprepared. The smallest union's president, John Shaughnessy of the Telecommunications International Union (TIU), claimed that management forced the strike. The largest union, representing 525,000 phone workers, was the Communication Workers of America (CWA). The CWA didn't expect a strike until it was almost underway. Also, the CWA's small strike fund couldn't sustain a long strike. In spite of these positive steps, the phone strike was definitely "under control.'' For information strikers depended on daily bulletins issued by the union, which offered the same platitudes dished up to the press about progess in negotiations. Negotations were carried on at all levels in secret meetings, and the negotiators were primarily union officials. Strikers do have the right to vote on ratification, but that ballot took place over a month after the back-to-work order. The structure of the strike reinforced a passive role for the actual strikers, whose primary function was to stand at isolated picket posts for a few hours a day. The structure of U.S. labor conflict is based on "experts'' on both union and management sides defining what is "negotiable'' and then proceeding to arrive at a "settlement.'' That arrangement, in which strikers are spectators of their own battle, is an important element in defusing the common (but difficult to "negotiate'' or "settle'') frustration and anger stemming from alienation, boredom, work quotas, and management. The humiliation of submitting to the discipline of a phone company job is well known (it's not uncommon to have to raise one's hand to go to the bathroom). Less clear is how that humilation, and the anger at it, is used by the union for its own narrow economic goals. Since "management's right to manage'' and capital's right to exist aren't rejected by the unions it follows that they cannot address problems about the qualitiative nature of work, or life in general. Even what solidarity there was was a mere shadow of a real class solidarity. For example, AT&T's vulnerability as a result of the divestiture process could have been exploited to better advantage. 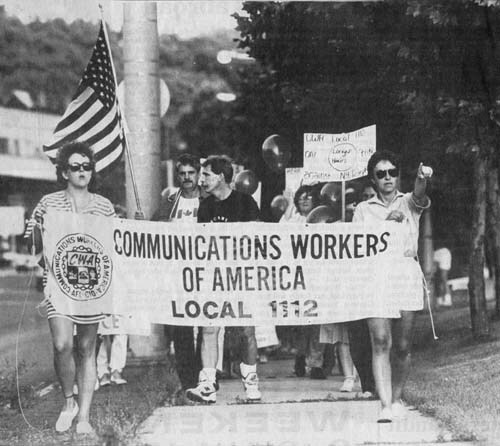 Instead of accepting the constraints of "acceptable demands,'' such as wages and working conditions, the strikers could have demanded that AT&T put up the money to modernize local phone systems, and thwarted its scheme to double the customers' costs. Such a demand would have created a natural unity between all phone users (most people) and the strikers against company and union negotiators who were trying to limit the issues, and against the courts and government bureaucrats who have set up the great "divestiture'' scam. Widely considered "progressive,'' unions are themselves capitalist institutions, having the function of bargaining over the sale of human beings. Collective bargaining is inherently oppressive since it always implies the continuation of wage-slavery and never allows for the termination of the selling of human beings, for any time or price under any conditions. Trade unionism, especially in its narrowest and most widely practiced form, is a vital support for capitalism, since it contains workers' conflicts within the logic of the system of buying and selling. In the phone strike, the workers did partially break out of that logic through widespread sabotage, albeit sporadically and unlinked to any radical demands or goals. There were perhaps a thousand incidents nationwide, many of which demonstrated great skill and good sense about targets. In New Jersey there were 25 acts of sabotage reported in the first three days of the strike. The most dramatic was a severed cable which cut off phone service to a New Jersey state police barracks and Fort Dix, a major army base. In the Chicago area there were 47 acts in the first week, one of which consisted of throwing a lit highway flare into a switching box, thereby cutting off service to the Du Page County Sheriff's Department. In California, Pacific Telephone reported there were 227 incidents of sabotage, for an average of over ten per day during the 22 day strike. Damage was done in most parts of the country, including Miami, Dallas, Detroit, Reno, Philadelphia, and many other places. This remarkable outbreak of direct action undoubtedly steered management negotiators toward conciliation. Beyond that, it kept the scab workforce in a state of "crisis management,'' where in addition to handling the ever-increasing backlog of routine repair and installation, they constantly had to attend to emergencies. In several areas the picket lines were militant. In Providence, Rhode Island pickets skirmished with mounted police, and in Brooklyn, New York a scuffle took place between strikers and cops, injuring three police and leading to the arrest of 3 strikers. In Dorchester, Massachusetts (a suburb of Boston) strikers surrounded three scabbing phone company trucks until they were dispersed by police. In spite of this direct action, union control and direction prevented strikers from resorting to a much stronger form of leverage: the occupation. Two years ago, in a strike against British Columbia Telephone (Canada), which is owned by GTE (U.S.), 11,000 phone workers occupied 20 installations over an area as large as California, Oregon, and Washington combined. At the height of their occupation, they controlled all telephone, radiophone, satellites, and cable in British Columbia, and provided free phone service to people during the six days. Similarly according to a recent report from Australia, phone workers were giving citizens free long distance phone calls from specific phone booths in major cities. What characterizes these tactics is the suspension of the business part of phones while maintaining their use value for the general population. In the U.S. phone strike, workers gained significant leverage by thoroughly disrupting basic information processing. The bulk of phone company information is generally only of use in billing or keeping track of ownership, etc., so disrupting it halts the smooth circulation of capital. The phone strike thus reinforced the power of clerical workers to hurt capital, though we probably won't hear much about it from most commentators. The fact remains, however, that an occupation would have totally halted information processing, and also information gathering, as workers could have tampered with or destroyed vast amounts of data needed for billing. In fact, the power to destroy vital data is growing. With computerization there is less paper or "hard copy'' evidence of what is "correct,'' so it is possible for workers to creatively intervene at each link of the infoprocessing chain. Phone workers are also uniquely positioned to exert tremendous leverage in solidarity with other workers. The selective cutting off of phone service to intransigent owners (or arsonist landlords or brutal cops for that matter) can be a powerful weapon in an increasingly hot class conflict. It isn't the new technology as an outside force which has disempowered workers, as Time and other establishment press claim. Capital has continually restructured work to expand its control, and new technology has always been a key to its strategies. The problems lie more with workers who don't grasp the power at their fingertips, instead relying on moribund and obsolete strategies imposed by a decaying trade union movement in its death throes. By taking direct control over worksites and labor processes, workers can make dramatic immediate improvements and begin to open the possibilities for a free future.